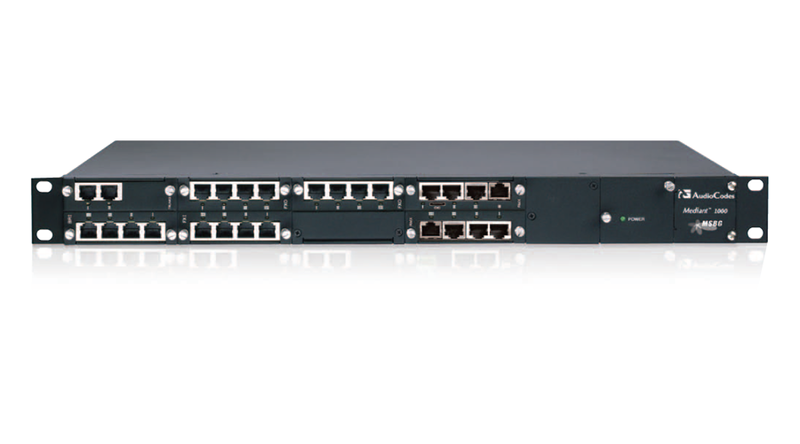 Includes M1KB-MSBG chassis, CRMX module (embedded CPU) with 1000Base-T GE copper interface and 3 LAN Interfaces, a single AC power supply and software license for 30 SBC sessions. Additional SBC sessions can be specified. The M1KB-ESBC can later be upgraded to up to150 SBC sessions. Product does not include RS-232 cable (part #M1K-RS232) which is used to access the CLI for serial communication. The Mediant 1000 E-SBC provides Perimeter Defense as a way of protecting companies from malicious VoIP attacks; mediation for allowing the connection of any PBX and/or IP-PBX to any Service Provider; and Service Assurance for service quality and manageability. Designed as a cost effective appliance, the Mediant 1000 E-SBC is based on field-proven VoIP and network services with a native host processor with integrated quality of service, SLA monitoring, security and manageability. The native implementation of SBC functions on the Mediant 1000 provides a host of additional capabilities that are not possible with standalone SBC appliances, such as VoIP mediation, PSTN Access, survivability, and third party value-added services applications. This enables enterprises to utilize the advantages of converged networks and eliminate the need for standalone appliances. Why Enterprise Session Border Controllers? Session Border Controllers were traditionally deployed at the border of service provider core networks. Both Enterprises and Service Providers have now realized the essential need of enterprise-based session border controllers, located at the customer premises for addressing the security, mediation and SLA requirements of the Enterprise. The Mediant 1000 E-SBC provides an open and flexible architecture for all Enterprise deployments, acting as the demarcation point between an Enterprise and a SIP Trunking provider, an enterprise and a hosted Unified Communication service provider or an enterprise and other organizations for direct VoIP calling.